Does the experience of starting one business make success with subsequent businesses more likely, or are second and third time entrepreneurs simply less driven and less willing to put everything on the line? Do the factors underlying business success – funding, networks, confidence, attitudes to risk, knowledge and experience – change throughout the serial entrepreneur’s career, and if so, how? What plays a bigger role in successful entrepreneurship: innate ability or experience? Although entrepreneurs may initially enjoy the quieter pace of life after exiting their first business, in time many begin to feel restless and seek fresh challenges. They crave a return to the responsibility and excitement of business, but question their ability to do it all over again. 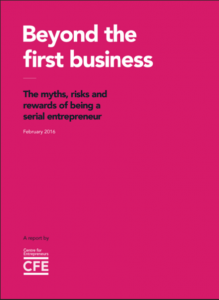 Reassuringly, our report shows that entrepreneurs often overstate the difficulties of starting another business, and shares insights from proven serial entrepreneurs on the secrets and pitfalls of founding a business the second time around. Serial entrepreneurship is just as beneficial to the health of our economy as it is to the individual entrepreneur. Serial entrepreneurs bring with them a wealth of experience, knowledge, contacts and capital that are key ingredients in any successful business. By encouraging more first-time founders to do it a second time, we can expect to see more start-ups and higher survival rates, along with improved economic growth, job creation, living standards and innovation.